Dunkin' Donuts continued its expansion into Southern California Tuesday with the grand opening of a shiny new donut shop in National City -- a highly-anticipated location with 24-hour drive-thru service. The business, located at 2139 East Plaza Blvd., just off Interstate 805, opened its doors bright and early, at 4 a.m., and patrons were more than ready. Buzzing with the excitement of those sweet treats waiting inside, customers began lining up for the grand opening at around 8:30 p.m. the night before. When the eatery opened Tuesday, the drive-thru line was already approximately 50 cars deep as Dunkin' Donuts fans hurried to get their fix. Customers in the drive-thru line told NBC 7 they’d been waiting anywhere from 30 to 90 minutes to get their doughnuts. For the brand's loyalists, it was well worth it. 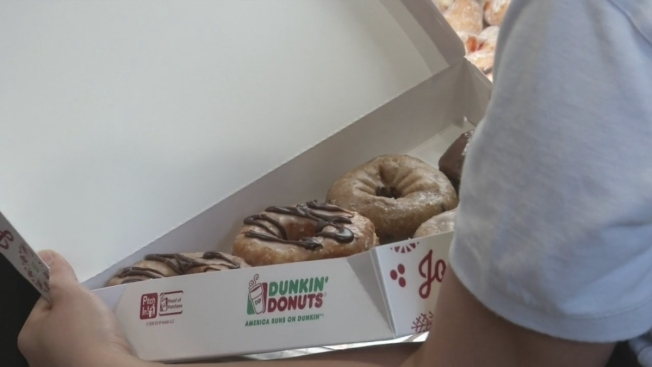 "I'd wait two hours for them doughnuts," one customer told NBC 7. Jordan McCoslin waited 40 minutes to get his doughtnuts. He said he kept his eye on the prize: the Boston Cream Croissant doughnut, which was worth the wait. "Half-doughnut, half-croissant," he explained. "What's not to like?" Talisin Burton, owner of the new National City location, said the turn out for his location's grand opening was more than he could've hoped. Dunkin' Donuts will open a new store Tuesday, December 6th in National City. A day before the grand opening, NBC7's Todd Strain received a sneak peak inside. "The turn out's been amazing. 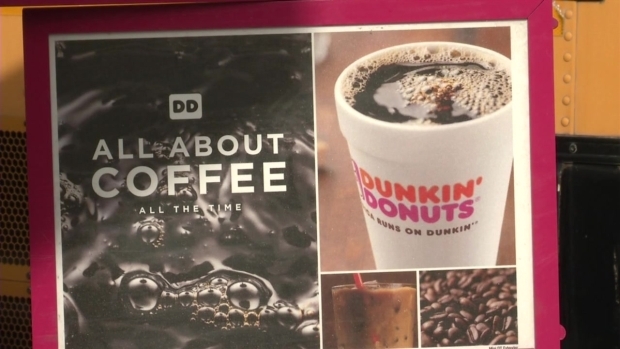 Doughnuts are flying off the shelves and the coffee is flowing,” he said, smiling. On opening day alone, this particular Dunkin’ Donuts is expected to sell about 18,000 donuts and thousands of cups of coffee. The restaurant in National City features the largest Dunkin’ Donuts sign west of the Mississippi River. The sign went up a couple of months ago, and generated much excitement among locals. And now, locals know that good things come to those who wait. The National City eatery is highly visible from the freeway and is expected to be a very busy location. Boardwalk Development, Inc., signed a lease with Dunkin' Donuts to create the new 24-hour sweets shop. In late July, Ron Bamberger, president of Boardwalk Development, Inc., told NBC 7 the shop's proximity to the freeway is a substantial benefit and will be convenient for morning commuters who want to pop in and out of the location quickly as they grab a doughnut on their way to work. This store is the second Dunkin’ Donuts drive-thru in San Diego County. The first local Dunkin’ Donuts drive-thru is in Ramona, though that location is a Dunkin’ Donuts and Baskin-Robbins combo store, so this National City shop is the first freestanding local Dunkin’ Donuts drive-thru in San Diego County. The new shop is locally owned and operated by the disabled U.S. veteran-owned business, Burton Restaurants, LLC. Franchisee Talisin Burton and operators Gregory Dono, Daniel Gomes and Frank Garner are all retired or current members of the U.S. Marine Corps. Burton Restaurants, LLC also owns and operates four other Dunkin' Donuts locations in San Diego: Camp Pendleton, MCAS Miramar and Balboa Naval Hospital, as well as a store at Embassy Suites in downtown San Diego. The next San Diego County Dunkin’ Donuts slated to open soon include a location in El Cajon and another at Naval Air Station North Island. Currently, San Diego County is home to these other Dunkin’ Donuts locations: an outpost at the Embassy Suites Hotel in downtown San Diego (601 Pacific Highway); a shop at Naval Medical Center San Diego’s Building 1 (34800 Bob Wilson Dr.); a shop at MCAS Miramar’s Building 5305; the Camp Pendleton location; and the Ramona Dunkin’ Donuts/Baskin-Robbins location (1410 Main St.).